With your family of eight it is easy to load up this Volante 360LF fifth wheel and head out to your favorite campground for a week of vacation. This model truly was built with your family in mind. 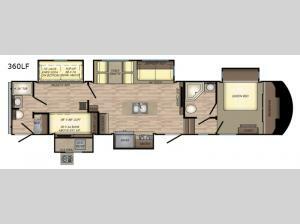 From the two full bathrooms to the bunk room with a 38"x88" loft there is a spot for everyone! This model also features two entry doors and the rear door leads to the rear bathroom so now you won't have to track dirt inside the whole trailer just to get to the bathroom. Come spend more time outside relaxing or watching your kids play while you fix a quick snack or your evening meal at the outdoor kitchen!